NEW YORK (Reuters) – Sierra Leone sold one of the world’s largest uncut diamonds for $6.5 million at a New York auction on Monday to raise funds for development projects in the West African country. The gem was unearthed in March in Sierra Leone’s eastern Kono region by a Christian pastor who gave it to the government to handle the sale. It was the government’s second attempt to sell the diamond after it rejected the highest bid of $7.8 million at an initial auction in the capital Freetown in May. Ahead of Monday’s auction the diamond was shown to some 70 potential buyers and received seven bids, Rapaport said. PRESIDENT ERNEST KOROMA MAKES HIMSELF, THE NATION AND THE WORLD PROUD—TRANSPARENT AND ACCOUNTABLE GOVERNANCE IN AN AFRICAN NATION HAILED. LIVE BROADCAST OF THE TRANSPARENT AUCTION OF THE MUCH -TALKED-ABOUT PEACE DIAMOND IN NEW YORK TODAY BY YOUR HUMBLE SERVANT, KABS KANU. “We showed the diamond everywhere. We did whatever we could and that’s the best price that we can get from the market today,” he said. One of the world’s largest diamonds was sold for $6.5 million by Sierra Leone on Monday to fund local development projects, dealing a blow to smugglers in the West African nation. Of the proceeds of the stone dubbed the “Peace Diamond,” the government will get 59 percent or about $3.9 million in tax revenue to fund clean water, electricity, schools, health centers and roads, said Martin Rapaport of the Rapaport Group. “As a government, particularly in Africa, it has always been the narration of corruption, and the mineral wealth is not benefiting the people,” said Abdulai Bayraytay, a spokesman for Sierra Leone President Ernest Bai Koroma, at a news conference. “It will encourage all the diggers back home,” Chief Paul Ngaba Saquee, head of Sierra Leone’s eastern Kono district, where the diamond was found in March, told the news conference. Another diamond and a further attempt by Sierra Leone to distance itself from its ‘blood diamond’ past. Auctions at a New York house are part of a strategy aiming for transparency over diamond sales. 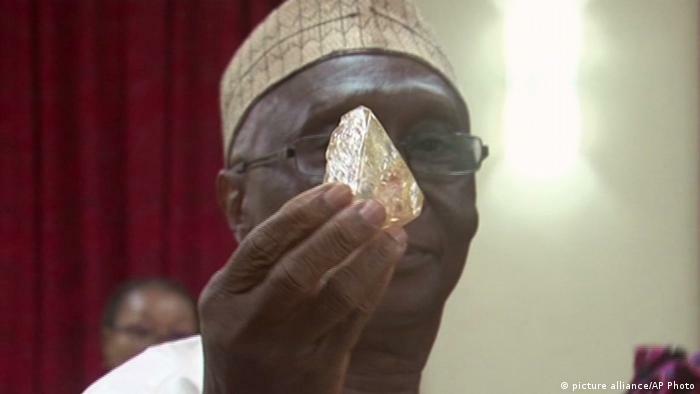 Sierra Leone’s National Minerals Agency announced on Saturday that miners had found a huge 476-carat diamond. It was discovered in the area covering the Gbense and Tankoro chiefdoms in Kono District in the east of the country. The agency’s director general Sahr Wonday said the Meya Mining company which uncovered the stone has been given government approval to export the diamond, which is to be sold at international auction by New York based diamond specialists Rapaport Auctions. The latest find follows the discovery of an even larger stone in March which is also to be sold by Rapaport, in early December. That stone, at 709 carats, is the largest to have been found in the West African country in fifty years and one of the 20 largest diamonds ever found. Both stones were discovered in the province of Kono in the diamond-rich east of the country. Two other special diamonds of 19.70 carats and 27.93 carats were discovered on the same day as the 476-carat diamond in the Kono District. Wonday said it “provides a remarkable indication of the potential of the mineral resources” in the area. The 968.9-carat Star of Sierra Leone was uncovered by miners in 1972 and remains the country’s largest find. The 3,106-carat Cullinan diamond found in South Africa in 1905 was the largest gem-quality rough diamond ever found. It was cut into several polished gems with the largest being set in the British crown jewels. Diamonds became tainted by association with the cross-border trafficking of diamonds which funded Sierra Leone’s civil war from 1991 to 2002. Rebel groups exchanged gems for weapons. The diamonds were mined by forced laborers who were killed or maimed by rebel groups if they refused to dig. Small-scale artisanal mining has been the norm since diamonds were discovered in 1930 but surface diamonds have been depleted and larger scale operations are developing. The 709-carat “diamond of peace” was discovered by Emmanuel Momoh, an Evangelical pastor and artisanal miner in the Kono mining district. The best offer received in a sealed-bid auction involving five buyers for the stone in April was $7.7 million (6.5 million euros), which the government said was too low. Some estimates put the value at $50 million. “We are grateful to the pastor for transferring the diamond to the government rather than smuggling it abroad,” presidency spokesman Abdulai Bayratay said at the time. Half of the sale proceeds are to be used to fund clean water, electricity, school, medical facilities, bridges and roads, none of which are currently available in the village of Koryardu, where the diamond was found, Rapaport said in a statement. The auction house is reported not to be charging its usual fees for the sale. The United Nations lifted a ban on diamond exports from Sierra Leone in 2003, although the diamond trade is still badly affected by smuggling.